The first of a number of posts on my recent long weekend in Calistoga, California. Pioneer Samuel Brannan touted Calistoga as a health and wellness destination, including the healing powers of the natural spring and mud baths by the mid 1860s. My daughter’s wedding almost two years ago derailed this year’s European travel schedule. Geena and I hoped our 50-something years would earn us trips across the pond but post high school education for three daughters has challenged our pocketbooks. So a trip to Tuscany will have to wait for another year. Instead the north end of the Napa Valley seemed a good alternative. Calistoga, California, a town of world-class wines, artisan shops and fine restaurants proved to be a perfect surrogate vacation spot. Calistoga is precisely what two overworked professionals needed. So we decided to put a dream of Tuscany on hold and spend a long weekend pampered by small-town hospitality. We checked into Fanny’s Bed and Breakfast instead of a local hotel. While this end of Napa Valley has fabulous inns, we wanted, no needed, some personal attention and innkeeper Deanna Higgins provided the human touch that helped make our stay memorable. Situated in a peaceful neighborhood only two blocks from Lincoln Avenue, the two-story is a short walk to a creek, park and old town. 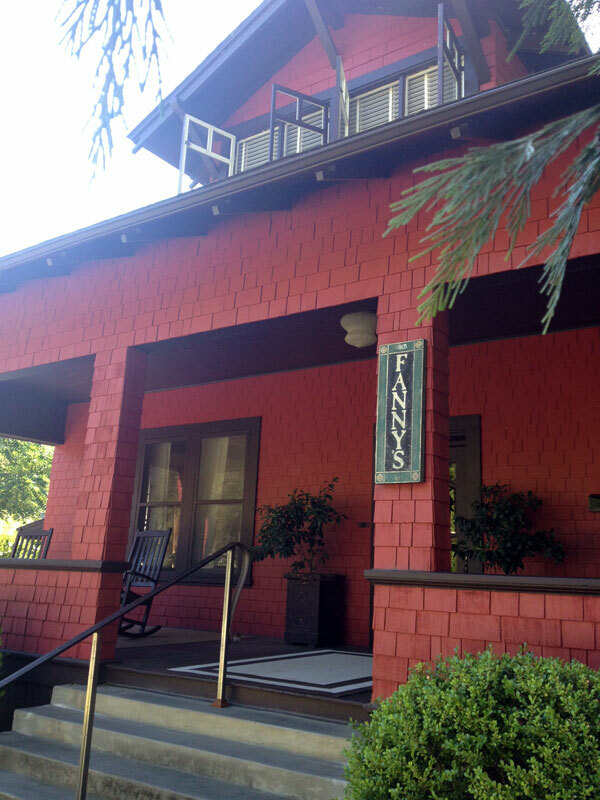 Tucked away in a quiet neighborhood, Fanny’s B&B is a wonderful alternative to the inns of Calistoga, California. Fanny’s, named after novelist Robert Louis Stevenson’s bride, is a quiet 1915 Craftsman-style cottage featuring a great front porch, rockers, and an old-fashioned swing–a true wine country retreat. Each upstairs bedroom is cozy and inviting, featuring plank floors, feather comforters, and window seats that will take you back to memories of Grandma’s attic. All rooms include a queen-size bed, private bath, and a sumptuous country breakfast. 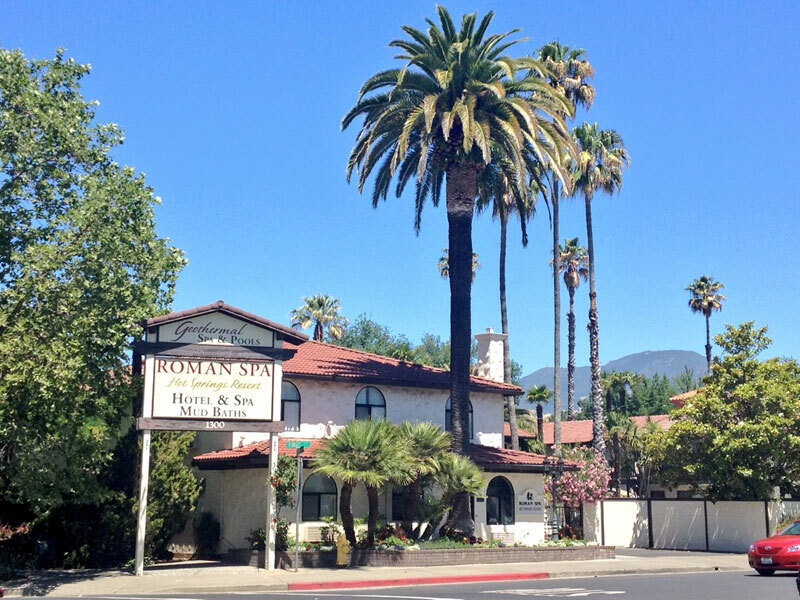 After asking for a short history, Deanna explained how Samuel Brannan helped establish Calistoga as a Spa town destination during the early 1860s. He hoped it would become reminiscent of New York’s Saratoga Springs. By 1868, Brannan’s Napa Valley Railroad Company’s track was completed to Calistoga, making the journey from San Francisco easier. Later the gold rush dominated the 1880s and the town flourished as a destination for health and wellness. Today day spas, including the Lincoln Avenue Spa, provide healing powers of local mud and mineral waters. The spas, coupled with outdoor recreational activities and wine tasting, create an outstanding health/wellness and vacation setting. Fanny’s Bed and Breakfast is well appointed and has been completely renovated. The charm is enhanced by Deanna’s attention to comfort. She offered us complimentary cold drinks, coffee and/or a bottle of wine after we settled into our room. In the 25 years since owning Fanny’s, Deanna seems to have perfected the art of hosting. She chats briefly with guest upon arrival and during her breakfast service. I appreciate how she allows guests free reign of the home without intrusion. I felt comfortable to relax in overstuffed chairs in the front room, enjoy the porch overlooking the large shaded yard and neighborhood> But when prompted, Deanna is quick to offer suggestions on area itineraries, including wine tastings, lunch and dinner spots and entertainment or recreational options. Guests at Fanny’s first enter into a marvelous, comfortable front room complete with fireplace, overstuffed chairs, window seats and bookshelves. Inside are interesting antique furnishings with homey window seats for reading. The collection of books, magazines and games in the eclectic library is complete with an array of nooks and crannies. The home has appropriate old-fashioned decorations which tell the story of someone who was well-traveled and connected to the house and Calistoga. I loved the attention to detail, including professionally clean, tidy rooms. 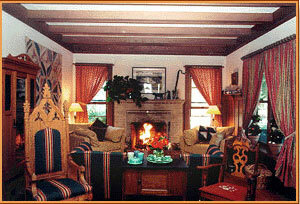 The home is air-conditioned in summer and the fireplace and atmosphere warms the home year-round. I absentmindedly left a pair of shoes in the room and Deanna was kind enough to mail them back without any hesitation. She was a wealth of information, wonderful hostess and fabulous cook who created varied, memorable breakfasts that were different each morning. While I do not often stay a bed and breakfasts, I heartily recommend Fanny’s Bed and Breakfast. Deanna can be reached via 1206 Spring Street, Calistoga, CA 94515. For more information on Napa and Sonoma Valleys, check out The Preiser Key. If you missed it, check out my June 26 post and wine review: Piccini Villa Cortile Riserva 2006 Brunello di Montalcino.